The new library and cultural centre is arranged as a three dimensional linear strip alongside Haigh Terrace. 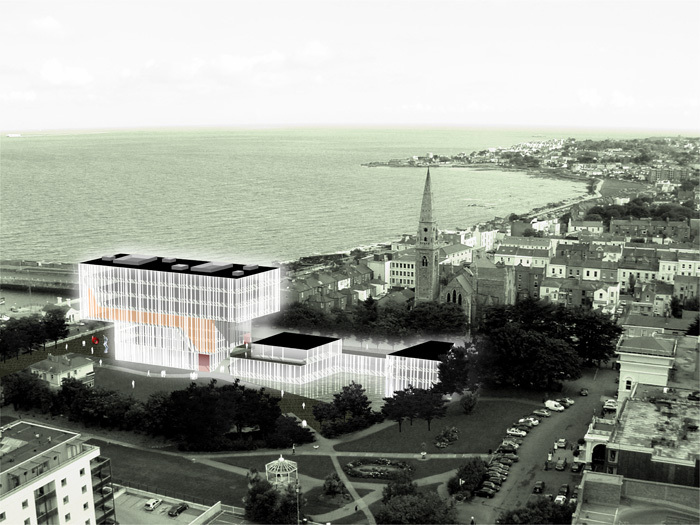 The centre comprises three distinct elements: the elevated library, the cultural centre at the level of Moran Park and a series of pavilions and entry points on Haigh Terrace. Dividing the programme into identifiable elements allows each component to articulate and address different parts of the surrounding context. It also facilitates movement across the site, making new links and connections, and allows for framing of particular views and destinations of Dublin.